Enjoy a rainbow of Hawaiian scents in your shower! HAWAIIAN BATH & BODY has created an All Natural Tropical Treat for face and body. 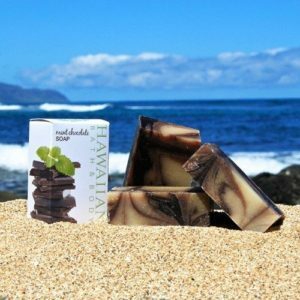 This natural Mint Chocolate Kukui Nut Oil Soap is made with healthy chocolate from Waialua, located on the North Shore of Oahu Hawaii. This soap is exclusively offered online at Hawaiian Bath and Body. The invigorating peppermint oil and Hawaiian chocolate aroma brings you back to your Hawaiian vacation over and over again. I absolutely love the aroma of Waialua Chocolate and Peppermint, it always reminds me of Hawaii. 3.2 oz. Handcrafted in Hawaii with Aloha, using the finest natural ingredients!